Rodney Sanders is always tough to beat. At the I-80 Speedway in Greenwood, Neb., it seems like it’s not even a fair fight. 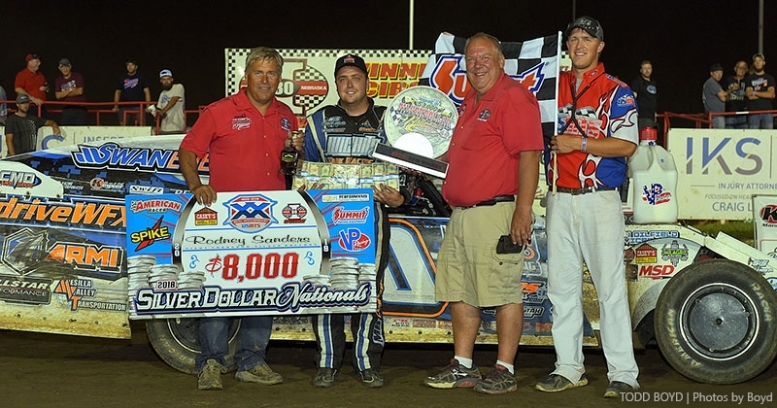 Sanders—the 2013 and 2014 USMTS national champion—led all 40 laps Saturday night to capture the United States Modified Touring Series main event during the 8th Annual Imperial Tile Silver Dollar Nationals. 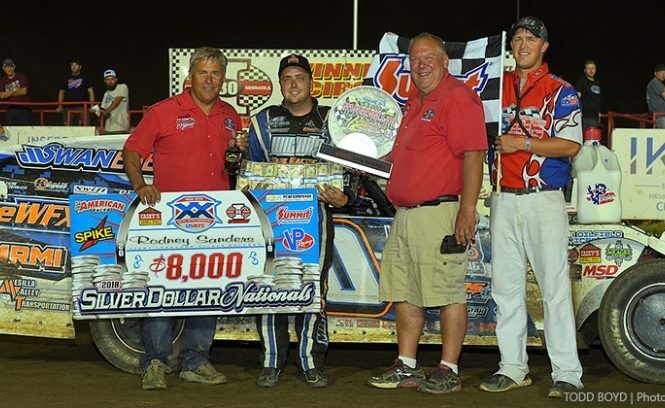 Since 2013, “The Sandman” has been nearly unstoppable at the Kosiski family’s 4/10-mile of clay nestled halfway between Lincoln and Omaha at exit 420—only twice, in fact, out of the 10 USMTS main events staged here since his first win five years ago. The 28-year-old from Happy, Texas, started on the pole and, despite three cautions during the last half of the race and a late charge by Jason Hughes, was never seriously challenged for the $8,000 winner’s share of the prize money. Hughes, making his first USMTS start since last month’s Masters event at the Cedar Lake Speedway, got by Lucas Schott following the race’s final caution with five laps remaining but could not get close enough to Sanders to make a bid for the lead. Zack VanderBeek claimed a fourth-place paycheck behind Sanders, Hughes and Schott while 16th-starting Stormy Scott held off his twin brother, Johnny Scott, for fifth.